I’ll never forget the day I saw a fight, literally a fist-fight, between a customer and an employee. It was at Kmart. “Excuse me?” the customer said. “Little B$#&@, yes you will!” No, she didn’t! Matching the customer word for word, Beverly spit out, “B$#&@, no we won’t!” I was glad Beverly got this customer and not me. The customer punched Beverly! For real, she did! What did my friend Beverly do then? Well, she knocked the crap out of the customer, and within 2 seconds, they were in an all-out brawl at the Service Desk. My teenage friend Beverly saw the customer as getting away with something, and she took that personally. Her personalization caused her to be completely unwilling to work with the customer. She didn’t want to discuss things, and she certainly didn’t want to give the customer an in-store credit. Taking things personally often is a demonstration of your loyalty to the company and your insistence on things being fair and right. But, sometimes, personalization can get in the way of serving the customer and moving things forward. 1. Have you ever gotten a bit personal with customers, to the point that you didn’t want to work to find a win-win solution? 2. What positive things does taking things personally say about employees? 3. What advice can you give any members of your group who tend to take things personally? How might you help them move toward a focus on finding amicable solutions? The small group brainstorm was powerful. Peers made suggestions, began coaching one another, and on their own, came up with approaches and tips to help their co-workers move out of a personalization mentality and into a win-win problem resolution focus. If you tend to take things personally, know that that just means you love your company and you’re fiercely loyal. Also, know that personalization can get in the way. It can make you more defensive and less willing to help your customers. Focus on moving forward and reaching amicable solutions. When you do, you’ll take some stress off of your chest and make your job a whole lot easier. 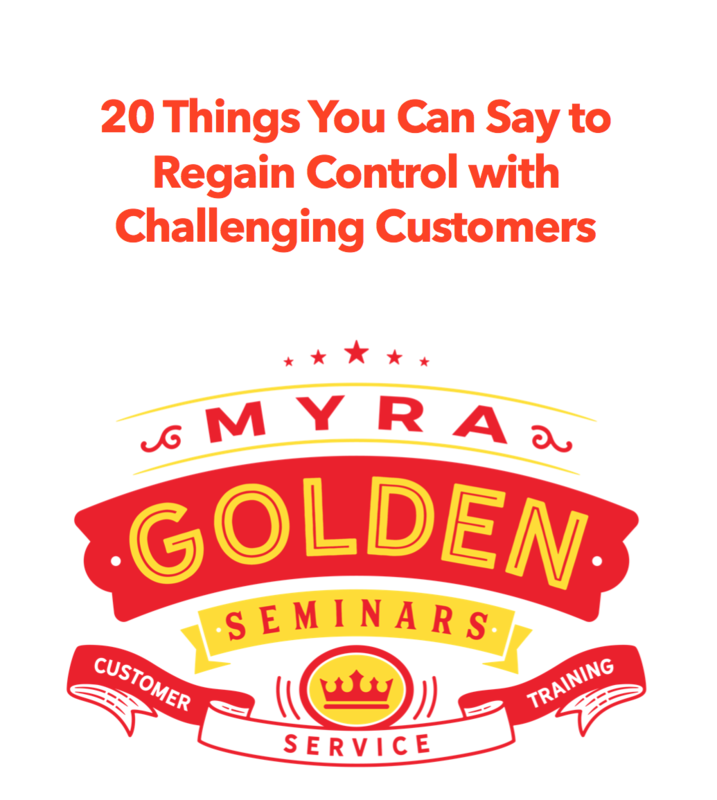 How long will it take for you to talk to us about having Myra deliver a customer service workshop for your employees?